Burbank, CA – One of the most interesting and unique cultural museums to become part of the Southern California landscape is the Martial Arts History Museum. Located in Burbank, the film production capitol of the world, the museum brings in thousands of kids every year as it opens the doors to understanding diverse cultures and Asian traditions. Now, in its 17th year, the museum is experiencing growing pains as more and more school groups put visiting the museum on their field trip agenda. 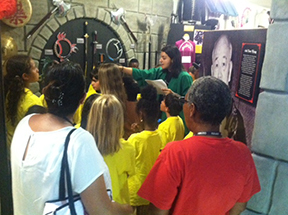 The Martial Arts History Museum has become a very popular venue for kids and the word has been spreading quickly. “We've nearly tripled the amount of school tours we do every year. 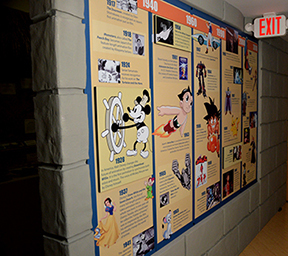 The kids really have a fun time because there are so many things they can relate to such as our anime history, our timeline of martial arts in the media and the very interesting movie props on display,” says museum founder and president Michael Matsuda. The good part is that there is an additional place for kids to learn and explore. The bad part is that there are so many requests, the museum is not big enough to accommodate the continually growing field trips. Although a 501(c)(3), the museum does not have the clout of the Natural History Museum nor the funding that the Japanese American National Museum or Autry Museum receives. Grant funding is very particular and most foundations have an established reputation and won't even consider supporting another facility. “Learning for a young child is not always easy. Here, at the Martial Arts History Museum we realize that and have designed our displays and tours so that kids can learn visually by our videos and colorful wall displays. They can adapt to reading from our interesting kid-friendly designs and learn physically, by taking part in our scavenger hunts. The entire museum was designed in fact by artists from Disney, Dreamworks, the Simpsons and Halloween set builders,” adds Matsuda. The Martial Arts History Museum, founded in 1999, is filled with traditional Chinese lions for dancing, Samurai uniforms, Thailand musical instruments, it explores the role the martial arts played in each Asian country and how it influenced their culture and way of life. Through its various historical timelines spread across the facility, it explores how Asian history became part of American history through films, television and even through the Olympics. School field trips have always been a fun part of growing up. Nearly everyone has enjoyed the Natural History Museum or the La Brea Tarpits. Having another unique, historical and even cultural place to visit adds to the diversity of learning and opens a child's eyes to other societies across the globe. Let's help the Martial Arts History Museum meet its $2 million goal and make a generous donation to provide an additional place for our kids. To help the museum grow, tax-deductible donations can be sent to the Martial Arts History Museum, 2319 W. Magnolia Blvd., Burbank, CA 91506. Website is Mamuseum.com or call (818) 478-1722. Tours can be booked at the same number.